The lady told us that the Stumbling Doctor was coming soon. See the drawing of the weird Dog X Snake creature behind me on the white board? 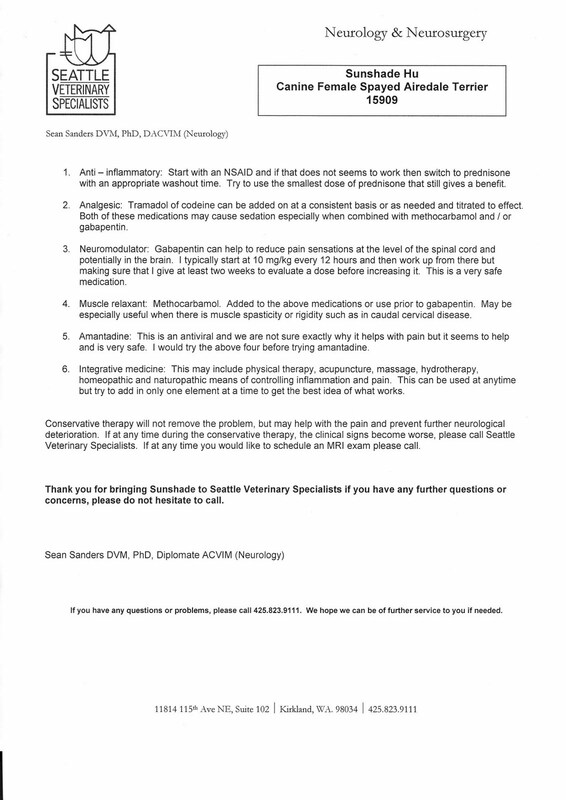 Dr. Sanders and SVS came highly recommended to us. My friend Darwin saw Dr. Sanders when she had an owie back, and my other friend Sam had his owie back surgery at SVS. That's not my brain! I'm sure my SuperBRAIN is prettier than that. 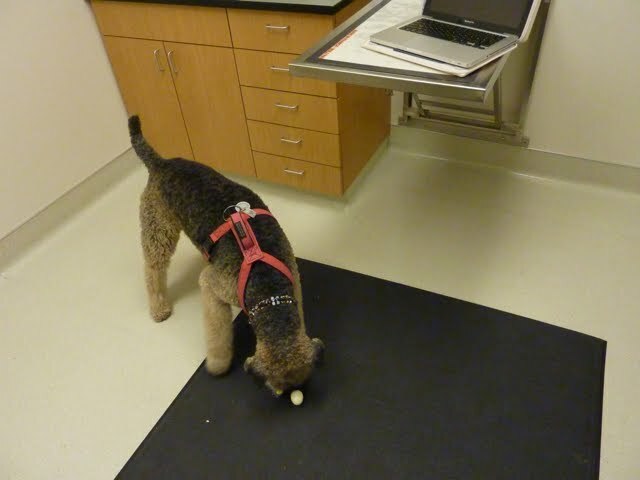 Mum and Dr. Sanders talked some more (while I finished the cheese chunks), and then we left the clinic. 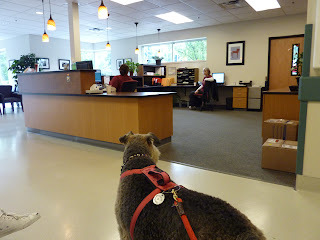 (mum: While we were in Seattle, I took Sunshade to see a Neurologist about her stumbling. Well, the result is inconclusive. 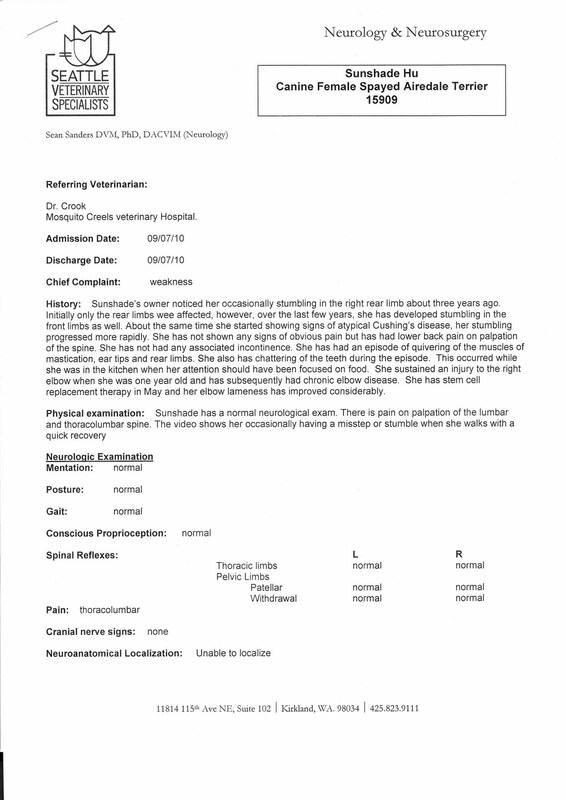 Sunshade passed the neurological exam. Dr. Sanders said he couldn't pin point or localize anywhere that he could confidently say ok, this is what's making her stumble. Basically, Sunshade's history didn't really fit with his findings to come up with a firm hypothetical diagnose. He said he could make sense that her lower back pain (probably a chronically herniated disc or DDD) is causing her hind legs to stumble, but couldn't tie that to front end stumbling. At any point on the spine where an injury happens, you would expect functions below that injury point to be affected, not above. 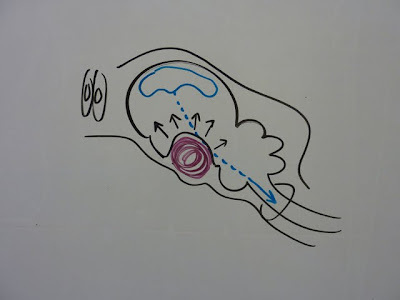 The "X" in the picture below is the spot where a pain response was perceived. 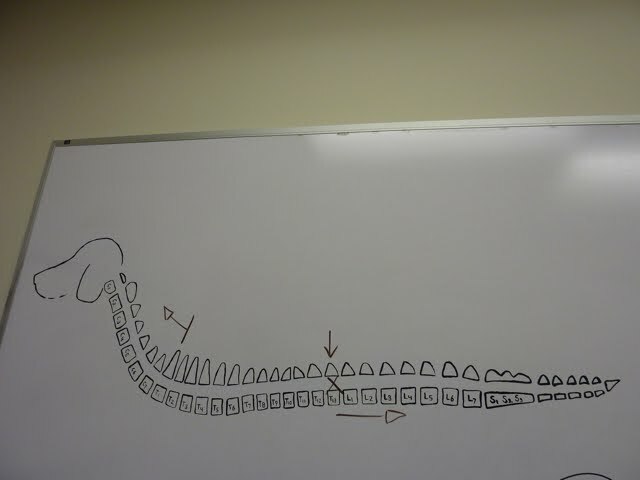 If Sunshade had a chronically herniated disc in her neck, then the front + back end stumbling could then be explained. Sunshade's neck was fine upon palpation. 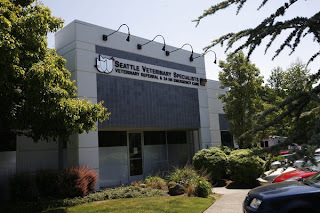 Dr. Sanders said he could make sense that a Pituitary Macroadenoma (tumor in the pituitary gland that also causes Atypical Cushings) is causing the front + back stumbling, but usually a dog develops severe neurological symptoms and is gone within a year's time untreated. That puts Sunshade at 4-6 months untreated if she does have a tumour. 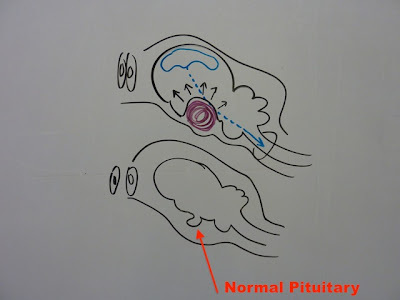 The diagram on the bottom shows a normal brain with a normal Pituitary Gland (red arrow). 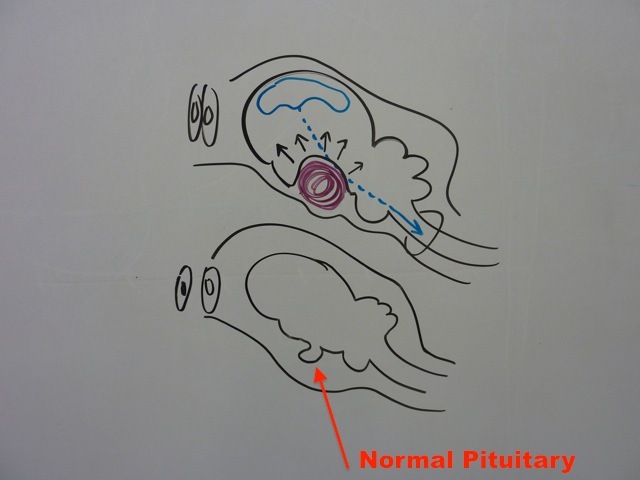 The diagram on the top shows a Pituitary Macroadenoma (purple ball) that's putting pressure on the brain. The blue area is the part of the brain responsible for motor function. 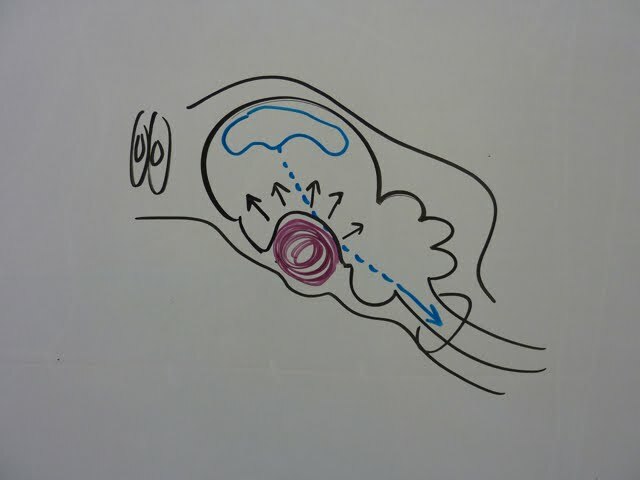 A macroadenoma can interfere with the motor function signals causing retardation in the motor function of the patient. 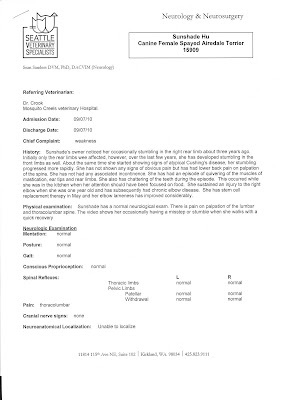 Sunshade was rated normal in the neuro exam performed. Her first stumble happened over 3 years ago, so that didn't really fit the Pituitary Macroadenoma profile - UNLESS the stumbles that happened 2-3 years ago were of a different origin (ie, ortho), then we could say it's of two unrelated sources causing the same symptom (stumbling). In that case, a Pituitary Macroadenoma might still stand. Another possibility is that its a separate brain tumour, unrelated to the Pituitary (Cushings), but that's stretching it a bit. Dr. Sanders did mention the stumbling could very well be from the built up of the various orthopedic issues that Sunshade has had throughout her life, and at age 11, she's dealing with what naturally (for her) comes with that age. Front end stumbling could just be from an 11 year old with tired biceps muscles from years of over compensating due to the bad elbow. 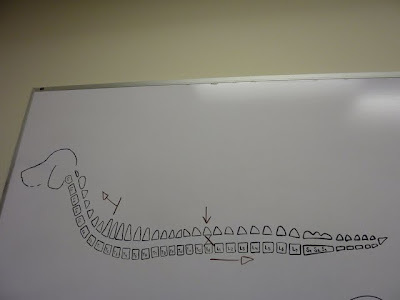 Hind end stumbling from the thoracolumbar/lumbar sacral region of the spine. He must have felt those were the more likely causes as he got his colleague, Dr. Kirkby, an orthopedic specialist to examine Sunshade as well. Dr. Kirkby had similar findings as Dr. Sanders. He also seemed to feel the front end stumbling was due to muscular weakness and aging. I asked Dr. Sanders if there were tests I should do that would play a factor in Sunshade's longevity. He told me at this point, the only thing he would consider would be an MRI. The MRI would be able to tell us if a Pituitary Macroadenoma is present. If she does indeed have it, then we can do radiation therapy. The success rate for radiation on this type of tumour is apparently very high. 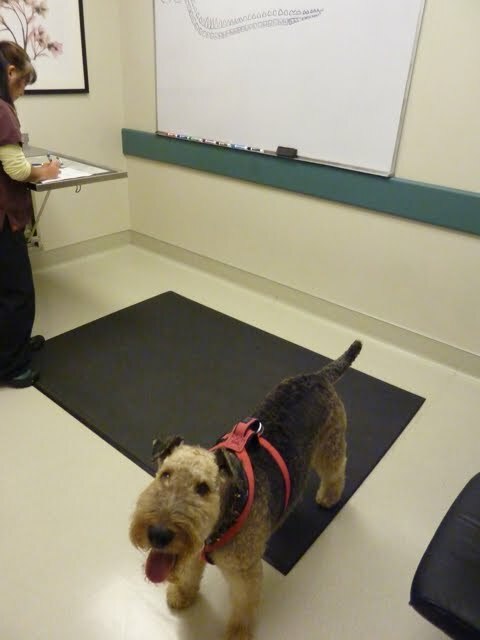 The radiation therapy involves 18-25 rounds of radiation over a 3-4 week period. 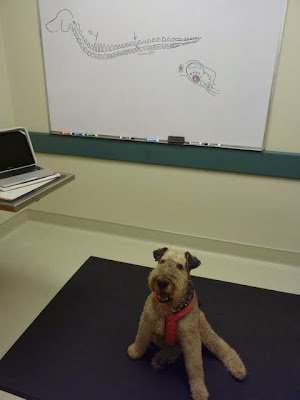 According to Dr. Sanders, dogs treated with radiation therapy are often older dogs, and they go on living anywhere between 2-5+ years of quality life without major neurological problems. Almost all of those dogs pass away from old age or other unrelated illnesses. 11 + 5 = 16 (years), not bad for an Airedale (not nearly enough for Sunshade...). MRI would also give us a better picture at what's going on in her lower back. 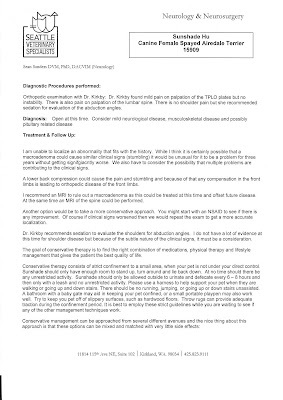 Dr. Sanders mentioned back surgery could be considered if the pros out weigh the cons, and if I was willing to take the risk since back surgery could make a patient worse than before. As far as I'm concerned, there will not be any back surgery for Sunshade, doesn't matter what the MRI say. So for me to do an MRI, it would solely be for the possible Pituitary Macroadenoma. But would I be willing to put her thorough 18-25 rounds of radiation therapy? I have no idea at this point.... 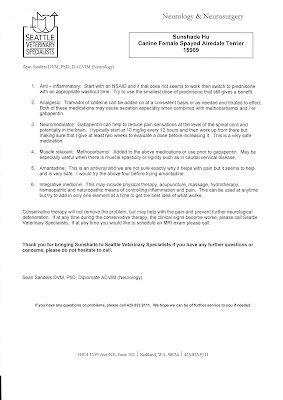 SIGH..
One thing that had me quite excited from our consult was that, neither Dr. Sanders nor Dr. Kirkby got any pain response from Sunshade's bad right elbow. Some of you might recall, she had the stem-cell replacement procedure done on the bad elbow back in April of this year. Well, I'm so happy to report that the elbow that had been my main source of worry over the last 10 years is now clinically sound, even after days of being active!!! Dr. Sanders was genuinely surprised to find out about Sunshade's bad elbow and the subsequent stem-cell procedure. 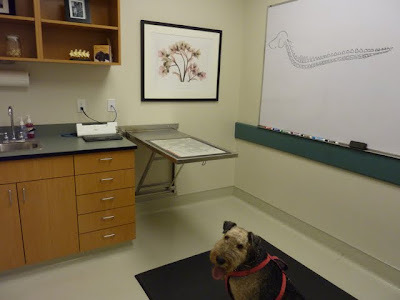 He said the elbow felt excellent and he was going to tell Dr. Kirkby that the dog he just examined (Sunshade) had a very successful Vet-Stem procedure. Apparently Dr. Kirkby had been wanting to take the Vet-Stem course. Thumbs up to yea Sunshade, and well done for getting the egg out the bag, good trick that one lol!! We can't imagine you having anything bad in your brain, Sunshade! You are the smartest and most clever DaleGirlie that we know! We are so happy to hear that your stem-cell procedure was a success! Don't think there's anything wrong with your SUPERbrain Sunshade .... look at how you're extracting the noms from the rucksack! All in all, seems like pretty good news! Good for you for taking videos so they could see the problem almost first-hand. SVS sounds awesome. Sunshade you did really good at the consultation. Welldone on the boiled eggie! We know your mom will do everything in her power to resolve any problems you have. Lots of airezen and pawsative thoughts & huggied to you both! Khongrats on snagging the handbag treasures! Sunshade. We've been waiting to read your consult feedback. You are one VeryLuckyGirl to have the family and doctors that you do. We know they will make the right decisions, because your best interests are in mind. In the meantime, keep doing what you are doing, healing joints and eating eggs and all. 'Cause it sounds like promising stuff to us. Hi Sunshade, I think that you and I are "veterans" of SVS. I think that Dr. Sanders gave your mum a lot to think about. I'm not sure what your mum is going to do about this whole thing but first things first. She'll have to weight the risk of anaesthesia to do the MRI or not. If mum decides to do the MRI, it will answer the question of whether you have a pituitary macroadenoma or not. If you do, then mum will have another tough decision. But like I said, first things first. It's better to take this whole thing and break it up into little steps or else we risk getting too far ahead of ourselves and worrying about what might be as opposed to knowing what we're dealing with. Either way, I agree with mum, no back surgery for you. Way too many risks, especially if you end up worse off than before. I'll be keeping my eye on you...hear...licks!! Stella and I were talking and we agree with Mitch & Maggie. There is NO WAY there is anything in your brain but SUPERDALE good stuff, and a little left over stinky attitude from your puppy days! We wish you long life and lots of play dates with admiring pupboys! hi Sunshade, it sounds like your mum has a lot to think about now. 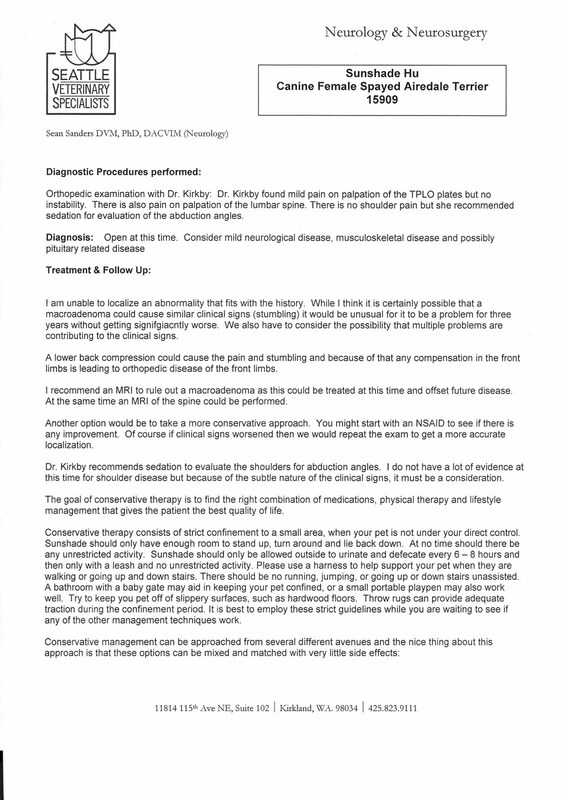 those neurology docs really like to push that MRI. 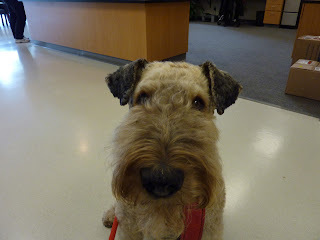 our human was extremely worried about Baxter having the MRI, but he did fine. But Baxter is only 6 years old. 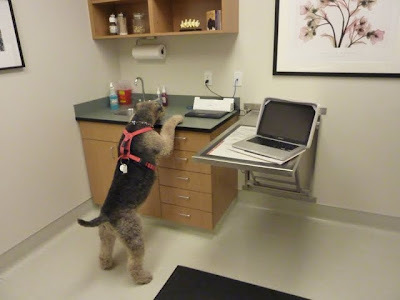 it's also very expensive, just for a diagnosis (which Baxter did not even get!). anyway, we're very happy to hear about your elbow and we will be interested to hear what your mum decides to do next. we will be thinking of you and we hope you will come visit us again, even though you don't like our stinky dog park. oh ms. sunshade... you definitely had an adventure.. all the way to washington.. i'm thinking that there isn't anything wrong with your aireeeedale brain.. your nose works well enough to find the egg and cheese! i, theBUSTER, understand the ways of the nose.. and well....you sound like you are doing mahvelous! ms. gracie and ms. blue and ms. persephone all send many slurps and buttbopps to you and hope they figure out the problem.. so you can come dancing..
Sunshade, that is sure a lot to think about and we agree that the back surgery sounds risky. We know one thing for sure though - your brain is working just fine! Keep us updated on what your mom decides, ok? How could there be anything wrong with your brain Sunshade??? They do realise you're an airedale right? Well done on the egg mate. You're a champion. Oh and we're all fine. Been visiting the kennel for a few days but we hope to be back in action soon. We have been very slack lately. Poor Sunshade. So many doc visits. 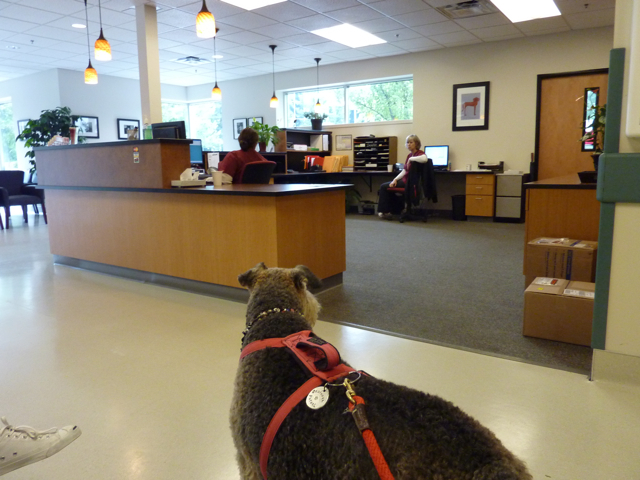 We're happy to hear your elbow is doing well, but back surgery does not sound like a good idea to Mama. She would be hesitant to have that done. Those things can be so risky on anyone. We think your superbrain is just fine, no tumors! Dear Sunshade, you seem to us to be a super smart doggie of great accomplishments. We wish you the best and will look to hear good news on the medical front. We know your mom & dad will take the best possible care of you. I wouldn't have the surgery performed on one of my cats or dog pals, either. I'm betting the stumbling is a cumulative result, as the vet said, of all the years of compensating for your other injuries. MRI? 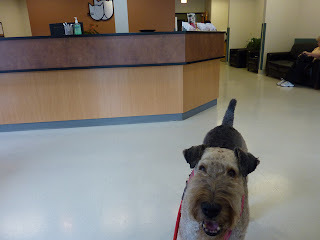 Maybe, depending on the anesthesia, which always makes me nervous for older (sorry to say that Miss Sunshade, lovie) dogs. If anyone can figure work the problem and figure out a solution, it's your (not) Evil Mum. She loves you like no other and takes care of you like no other. You're a lucky girl! Sunshade, we are totally thrilled that your elbow is doing so well! We know your mum will make the best possible decisions regarding your healthcare! After all, you ARE her baby! So sorry about Sunshade's many trouble, I know how it feels, Jasmine is also a constant challenge! I love that the elbow is doing so well after the stem cell treatment! Jasmine also had stem cells injected in her knees and shoulders two years ago and the injected areas are doing great. It is her left elbow now that is acting up and stem cells are being scheduled for that. I would love if you'd share Sunshade's stem cell story on my blog, or any other part of the story you'd find relevant and helpful to my readers. 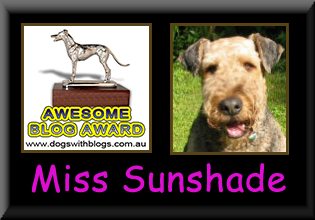 We have an award for you and Stinky, Sunshade! Check out our blog when you get a chance, okay. ow can they rate you as 'normal' after the examinations?? You are not 'normal'.. normal is blah.. you, Miss Sunshade, is SUPER!! Hope everything goes well Sunshade..